This wonton soup is a comfort food. 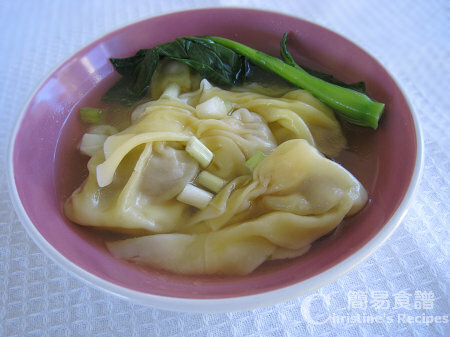 The wontons are silky, slippery, the stock is aromatic. These Cantonese wontons are very popular in Hong Kong. The fillings of Cantonese wontons are mainly prawns (shrimps) mixed with minced pork. Yellow chives seem to be a must to be added. Unfortunately, it’s very hard to find any yellow chives throughout the year in Australia. So I just used spring onion (shallot), adding a fresh green flavour though. The flavours of the soup are rich and the texture of wontons is very tender. Marinate minced pork for at least 20 minutes. Put pealed and deveined prawn under cold running tap water for 5 to 10 minutes. This step will make the prawn meat crunchy. Drain well and pat dry with paper towels. Dice prawn meat into 1.5cm cubes to make about 175g. Blend the prawn well with the seasoning. Cover and chill them for 15 minutes. Stir chilled prawn meat in minced pork. Prepare 4 tablespoons of water in a little bowl for wrapping wontons. Place one rounded teaspoon of prawn and minced pork filling in center of wonton wrapper. Dip a finger in the little bowl of water and run along bottom edges of wrapper to moisten. Gather the corners of the wrapper, lightly twist to enclose filling. Repeat with the remaining filling and wonton wrappers. Set aside. Heat chicken stock in a large saucepan on high and bring to a boil. Cook Choi Sum or baby pak choy in the stock. Usually I place the hard stems in the stock first, then followed by the leaves. Cook until softened. Add salt, white pepper and sesame oil to taste. Set aside. Use another wok or saucepan to cook wontons with boiling water. Carefully place wontons in the boiling water, stir immediately and don’t let them stick to the bottom or stick together. When the wontons float to the surface, that means they are cooked. Transfer the cooked wontons out with a strainer and divide them between bowls. Ladle over chicken stock and serve with vegetables. Sprinkle spring onion or yellow chives if desired. You can just buy minced pork from any supermarket. Usually I use pork neck and mince it with a food process by myself. Jut rinse pork and pat dry with kitchen papers. Cut into chunks and mince the pork meat in a mini food process. The water will become cloudy after cooking wontons. And that’s why we used another saucepan to cook wontons. Hong Kong people like clear soup going with wontons. As soon as I get the opportunity to start focusing on cooking again, I need to try this dish, as well as the baked tapioca you featured a while back. They both sound wonderful. My husband, without fail orders wonton soup at every opportunity and I'd love to try this for him. This wonton soup and the baked tapioca are my favourite snacks. Can't miss them. Your husband must be very pleased when you cook wontons for him. Really want to know how he likes it. Wow, it would be great to give this soup a try. Looks amazing. Christine, may I ask why you choose to use pork neck for the minced pork? Because I usually use pork belly -- for me the slightly higher fat content can solve the toughness in minced pork. 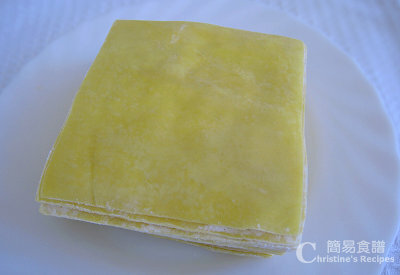 I like to wrap Shanghainese wonton -- wonder if you have tried that before? I followed your instructions to the T. Which is a little different from how i usually make mine. But your recipe turns out much much better. A slight twig to the recipe is that i add fish sauce instead of soy sauce. My toddler loves this! I used pork neck simply because of its tender texture with a bit of fat mingled inside, not as much as pork belly. And the pork belly that bought from the butches here usually has got a skin on it. If I use pork belly, I have to remove the pork rind before mincing. I just feel pork neck is quite handy. Yeah, I tried Shanghainese wonton. Love it. That's great.Your toddler loved these wontons. My daughter also likes fish sauce very much. But we haven't tried to dip wontons with it. Could try! To cook Chinese stock is much easier than western soups. Just put old chicken, pork or Chinese ham (金華火腿)in a large pot with enough boiling water. Cook at least 4 to 5 hours. Done. The above-mentioned ingredients are quite expensive. So I normally use chicken frames, available at supermarket, 1 dollar each, add pork shins and/or any veggies if you like. Cook 4 hours. Strain out the ingredients. That's it. Or you can buy canned chicken stock. You can use the stock on the go. My wontons keep falling out of the wrappers. Any tips? Damp the wonton wrapper around the filling and twist. It would help. Can unused and uncooked wontons be stored in the fridge and for how long? Wld the wonton skin become soggy from the juice of the filling? Thank you. Sure, I often freeze the uncooked wontons. No, they won't turn soggy. Simply place them on a pan or plate, lined with plastic wrap, in one single layer, not letting them touch each other. Chill them in a freezer about 25 minutes or until they're frozen. Then you can transfer them into a plastic bag to save room in your freezer. They can be kept up to a month. Hi Christine, just wanted to double check the weight of the prawns in the recipe (175g) is before peeling off the shell? Thanks so much.